This Clear Glass and Transparent Borosilicate Teapot infuser provides an experience to be cherished by tea lovers. The teapot is heat resistant which means you can use it on a gas or electric stove top. Watch the water and tea boil in front of your eyes! If you think you rather heat it in the microwave, then why not! We wanted to provide our customers with four EXTRA double walled glass cups so that you can enjoy your tea with your friends and family in style! The tea pot is super easy to clean - just remove the parts and put it in the dishwasher. We ensure that that infuser was removable so that it can be removed once the tea has been steeped to your liking. It has also been specifically designed to be deep so that if you fancy a tea for just 1 person, you do not have to fill the teapot right to the top and waste precious tea! Make the tea for 1, 2, 4 or more individuals and persons - this elegant teapot fits all situations and occasions. [ WE CARE... ] and that's why we bring to you this Beautiful & Elegant Glass Tea Infuser! Why not relax whilst you watch your tea brew and be transported to a 5* spa experience in the comfort of your own home? The unique combination of usability and aesthetics makes it a perfect accessory to your pamper hamper. The tea pot holds 35 oz allowing you to serve 4 to 6 cups worth, whilst enjoying your tea with family and friends, whether that be at parties, dinners or any social gathering! [ LOVE GIFTS? ] "Wow" your family and friends with such a unique gift idea! The box comes Perfectly packaged taking away from the tedious task of wrapping the product. This "authentic-meets-modern-set" can be given as a house-warming, wedding or anniversary gift...the list is endless. This appeals to people of all ages and background. A safe and beautiful choice. Order your teapot now, while stock last - and another one for your friend. 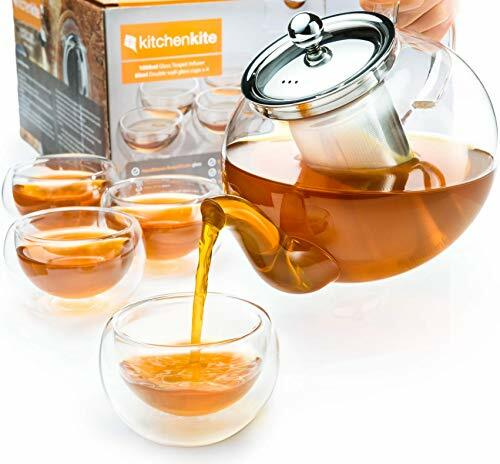 [ 3 IN 1 STOVE TOP, MICROWAVE & DISHWASHER SAFE ] These features make this premium and high quality borosilicate glass teapot practical for use in any setting. Why not put it on any gas or electric stovetop and use it as a kettle? You can heat or reheat your tea in the microwave as a quicker alternative. All components of the glass teapot can be washed in the dishwasher, making tea hosting a breeze. Make your tea however your heart desires and bring out your inner tea enthusiast. [ COMPLETE TEA POT SET ] Not only are you getting a teapot but also 4 double walled glass cups, making it a complete serving set. Drink with style and not worry about matching tea cups anymore! The tea maker comes with a rust-free stainless steel tea strainer basket holds teabags or loose tea leaves which can be removed after your tea has steeped. The deep infuser goes right to the bottom of the teapot so that if you only make tea for one or two, you don't have to fill it right up to the top! [ RISK FREE PURCHASE ] You are our top priority so if for some reason you are not satisfied we will provide you a 100% refund within 90 days of purchase. This teapot has been designed with the intentions of improving your tea making and serving comfort. Therefore, I now invite you to make this risk-free purchase and click the 'ADD TO CART' button and alter your tea experience forever! If you have any questions about this product by Kitchen Kite, contact us by completing and submitting the form below. If you are looking for a specif part number, please include it with your message.